In the middle of April 2018 I was finally able to fullfill a yearlong dream of mine and, thanks to the invitation of my sponsor Red Fox Outdoor Equipment travel to Russia for the first time in my life. The journey was incredible and full of valuable experiences for me. 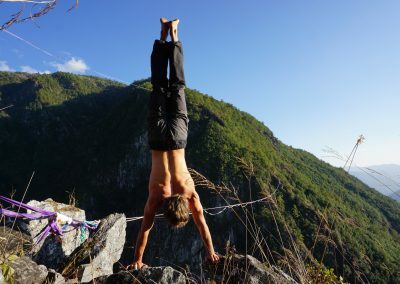 The trip consisted of three parts: First, at the 2nd Russian Highline Festival in Kislovodsk, I set up the longest highline in all of Russia, together with the Russian slackline community. 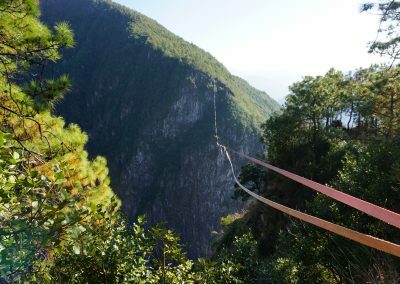 I managed to walk this beautiful 280m long and 100m high line on the first attempt and got the first ascent. 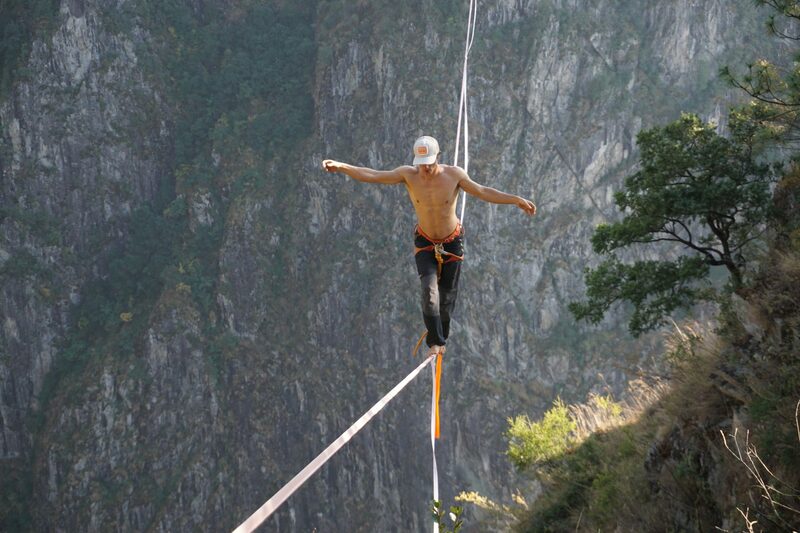 Thus we had a new Russian Highline Record and named the line “Na zdrowie”. The athmosphere in the community there was truly amazing! Then I made my way to the Mt Elbrus, at 5642m the tallest peak in all of Europe. 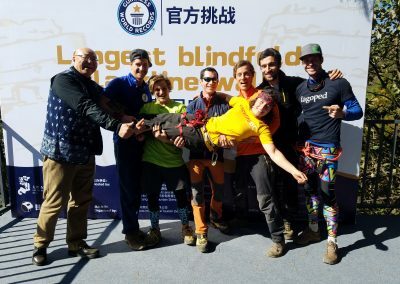 For the opening ceremony of the annual Red Fox Elbrus Race I had the honor of doing a highline show in front of the participants and the audience of the race. With 2500m above sea lvel, this line was not only my personally highest elevated highline, but also the until then highest one in all of Russia. I spent the last week of my Russia trip in beautiful St Petersburg, where, in addition to sightseeing and city vacation, I also found the time for a very extraordinary and adventurous highline: an urban industrial highline in an abandoned and ruinous factory. Stay tuned for the videos! In December 2017 I went to the Middle Realm for the second time. 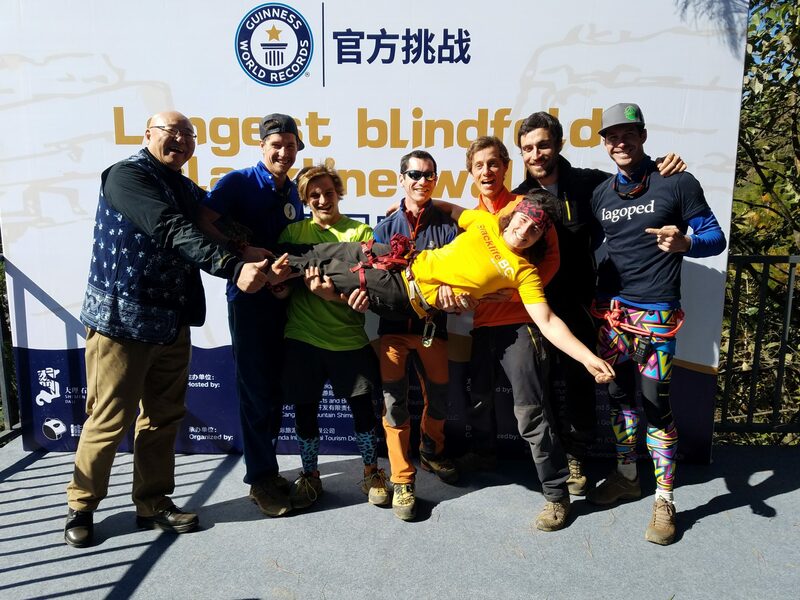 Together with my good friends Pablo Signoret, Mia Noblet, Samuel Volery and Ryan Robinson, I attempted a truly top class Guinness World Record: The longest blindfolded highline walk ever. Thanks to our week long training, we all managed to walk the highline blindfolded on the very first attempt. The Guinnes World Record title went to Pablo Signoret though, because he had the fastest crossing of the line. Congratulations and huge thanks to the slackline team SDD for the setting up this line and inviting me to this fabulous and crazy event! On December 14, 2013 I had my very first big TV appearance, and it was in no other than the famous German entertainment show “WETTEN, DASS…”. Of course my bet had to be Christmas themed and thus I bet that I would be able to blow out six Christmas candles by “surfing” on a slackline. 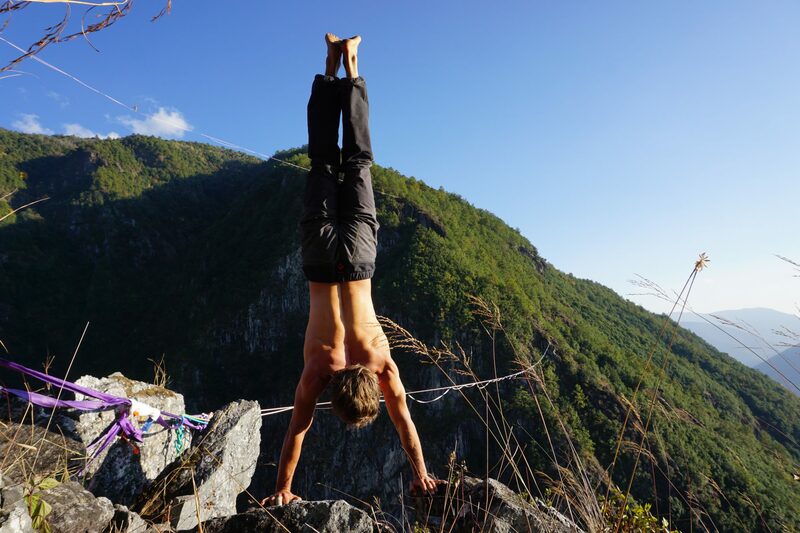 And I had to do this without falling or stepping off the slackline, and in under 90 seconds. I just barely made it! But to be elected the “king of bets”, the winner of the show, I just barely did not get enough votes from the audience. 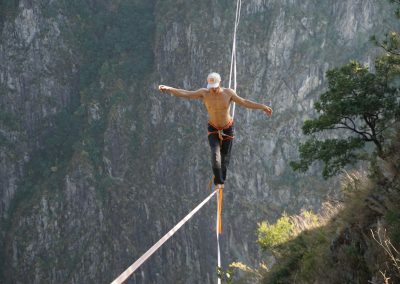 But I became second place and the foundation for my career as a professional slackliner was layed!